Next week we launch a week of DIY space content—projects, tutorials, and ideas that we hope will have you looking to the stars—and running to your workshop. We’ll be featuring articles on make-your-own rockets, weather balloons, satellites, and DIY astrophotography. 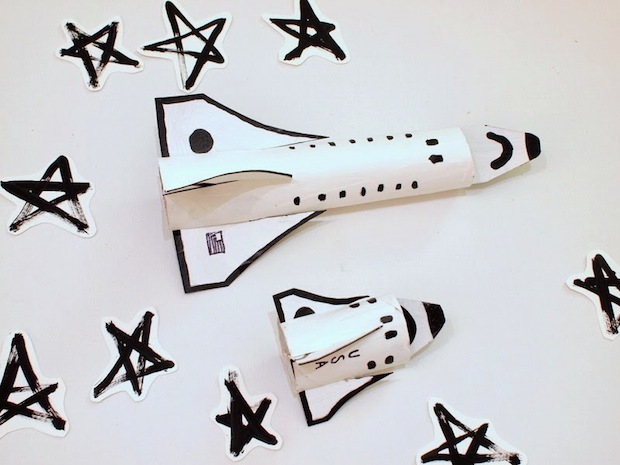 We’ll even tell you how to make your own space suit and astronaut ice cream. NASA contractor and MAKE contributor Matt Reyes will be guest editing so you know it’s going to be a blast (off). DIY space mixes the known and the unknown, requires a good idea but moves past it, and then hurls it into one of the harshest environments ever to see if it survives. Over the past three years, we have shifted from asking whether amateur space is possible and instead moved to the fundamental question of what will you do and why are you doing it. We’re at a point where the tech is plentiful and information is exchanged freely. The truly tricky part of DIY space isn’t the space part. It’s that, by the time you read anything, someone else has already pushed things further, built something more clever, or made something hard, simple. DIY culture is an awesome mix of sharing things that work and fighting each other to prove the impossible. Everyone helps newcomers enter the DIY world, riffs off each other, and pushes each other to excel all at the same time. DIY is more than ideas, but certainly a unique idea is a treasure. In this, there’s a self-promoting tendency of DIYers each trying to claim ‘first’ for their project. I say let us– every new incremental step moves us all forward, and a little egotism can be a good motivator in DIY culture. Just be careful to maintain balance in understanding that your new idea is built on a shared culture, that even mavericks are boosted by the efforts of others. Do that, and you can score any new ‘firsts’ you can dream up. Or, simply enjoy building something yourself, with or without novelty. If it’s new for you, that’s new enough. Just as the ISS NanoRacks deployment program pushed out 33 new CubeSats in a span of a few weeks–I guarantee not all of them are ‘ideas never flown by humanity.’ But equally guaranteed is each is new for the DIYers and universities and small groups that built the satellites. What distinguishes DIYers from spectators is we move past the idea into actually building and executing our mad schemes. For space, it’s worth understanding what Chris Scolese (the NASA/GSFC Center Director) meant by stating that integration and test is the critical path for success. This is both the key and missing piece for DIY space to become more mature. Integration at its core is just taking stuff that works separately, and getting them to play nice with each other. Testing is either the coolest or most boring part of DIY. Cool, in that you get to try to break your new stuff; boring, in that you have to do it over and over. Embrace both, so when your project hits space, it succeeds. Participating in DIY space doesn’t require that everything push the envelope. Just mixing known solutions yields coolness. The ISSAbove project takes an ordinary Raspberry Pi, some known software solutions for predicting orbits using data fetched from the web, and turns it into DIY coolness by making a box that lights up when the ISS is above your house. Folks are taking ground-learned solutions for constellations and swarms of robots and copters and starting to apply them to satellites. Other folks are simply working to make it easier to communicate and operate space stuff. DIY operates brilliantly when taking cross-disciplinary ideas or simply in combining known stuff in a way no one combined it before. Don’t worry if this makes space seem ordinary. Space is still a really hard target to hit. Space is a hostile environment, one of the big three; space, ocean, and inside the human body all share weird mixes of pressure problems and materials behaving oddly and combined with sheer inaccessibility and the fact you can’t really fix mistakes once they happen. The tech is there, but the key to space is realizing you have to execute your project really, really well because you have only one shot. There’s no post-launch tweaking or second chances. There are so many areas where DIY space is really active. Obviously, actually building and hurling DIY satellites into the void is hot and gets a lot of press. It’s not just tech demos, either. Folks are starting to tackle science problems using pico- and nano-satellites, going to orbit to gather ionospheric data or remove orbital debris or spot asteroids. There’s a LunarCubes movement tackling the need for nanosat propulsion to get past Low-Earth Orbit and visit the moon, asteroids, planets. And of course PocketQubes and sprite concepts are actually flying and proving that we can send satellites that are smaller than ever yet do 100 percent of what’s needed. DIY space also isn’t just space. Efforts at building up a stable (often open source) infrastructure in terms of hardware, radio work, and ground stations is quieter, but growing just as much. Space awareness– projects that listen to space, look at space data, or connect us on the ground with what’s going up outside our Earth in a meaningful way– is starting to heat up as DIYers use clever methods to tap into existing space-based data. As the DIY culture builds, we’re seeing STEAM efforts that add ‘art’ to the usual STEM approach, which draws more people into what we do. In short, DIY has it all as a mix of proven and new, first tries and sustained efforts, tech and science and art, all powered by people and going to space. It’s a good time to look past Earth, and everyone is invited along for the ride.